When your girlfriend is in the mood to bake scones, you must fully support her! 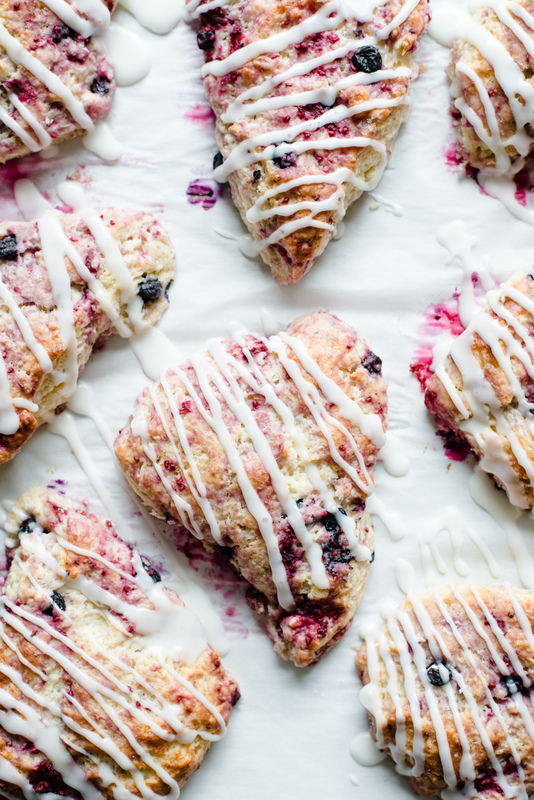 Especially when it comes to these amazing Berry Scones. If you know me, you probably know I love coffee. While I’m not a huge dessert guy, I do love dessert when combined with coffee, and scones fit right into that. I’ve always been partial to them, but so often they come out dry and unappetizing. Thanks to sour cream and berries, these were perfectly moist and had just the right amount of sweetness, due to the delectable glaze. Often, when perusing Pinterest for recipes, you’ll find that everything says “The BEST…”, and after looking at a bunch of sad pictures making this claim, that whole tagline really wears off. Fortunately, these really were some of the best scones we’ve had, and we’ll definitely come back to this recipe next time we are jonesing for some scones! 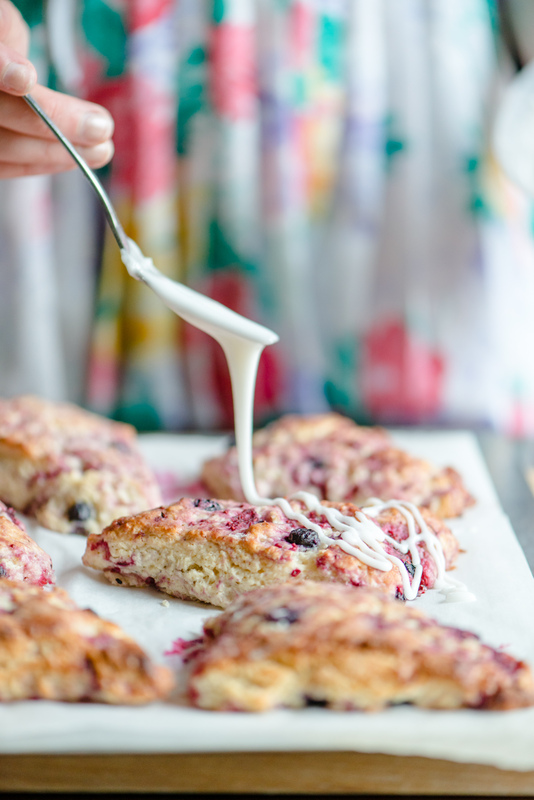 Moist, fluffy scones, filled with berries and topped with a sweet glaze. In a large bowl, combine flour, granulated sugar, baking powder, and salt. Whisk to combine. Add the butter with a pastry cutter or two forks, cutting the butter in. Mash in the butter with your forks until it starts developing to the size of large marbles. From there mix in with your hands, until it feels like wet sand. There should still be some pea-sized chunks of butter, that is okay! 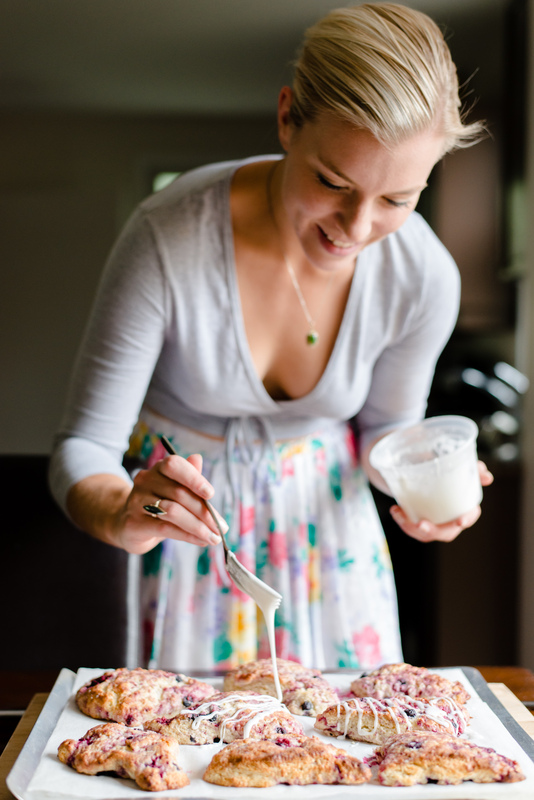 In a small bowl, add egg, sour cream, and vanilla, whisk until smooth. Add your wet mix to the dry mix, and gently fold with a spatula until just combined. Don't overmix, otherwise you will have dense scones. The mixture will be wet and shaggy. Fold in the berries and zest. On a clean work surface, sprinkle a bit of flour, and place dough onto surface. Gently form into an 8 inch round. If the dough is too wet and sticky, add a bit more flour to your hands while forming. Cut dough into 8 equal wedges. Place wedges onto the parchment lined baking sheet, making sure there is about 2 inches between each scone. Bake for 18-20 minutes, until scones are lightly golden and a toothpick can be inserted and removed cleanly. For the glaze, combine confectioners sugar and milk, whisking until smooth. If the sugar is too thick, add more milk, if too thin, add more sugar. Once scones have cooled, drizzle with glaze. Recipe derived from Averie Cooks. Now go forth and scone!